The aim of Rongali 2017 was to recreate Bor Axom or Greater Assam, including all its tribes and ethnic groups like the Bodo, Mising, Karbi, Dimasa, Tiwa, Sonowal Kachari, Singphoh, Deuri, Tai Phake, Thengal Kachari, Ahom, among others. 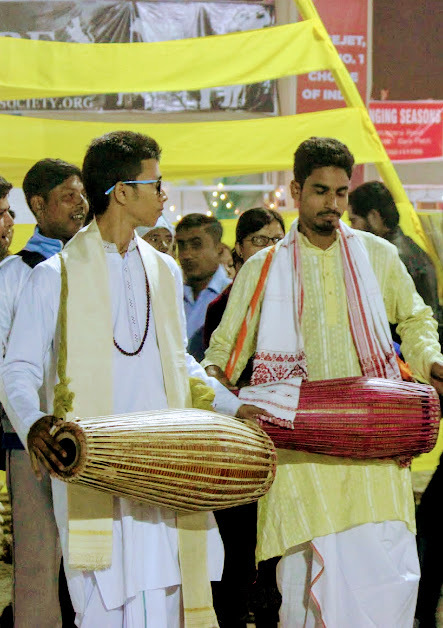 In other words, Rongali was a celebration of Assam’s diversity by showcasing the syncretic culture and lifestyles of different communities through their food, music, and dance. Traditional houses of some of the tribes (like the one below) were also recreated at the Rongali venue for the very same reason. A visitor could walk into the house and talk to the ‘residents’ to know more about them, their lifestyle and their community. A Bodo house complete with a loom. The events organised at Rongali 2017 were a mix of the old and the new and there was something for everyone. Traditional dance and music, as well as rock music and DJ shows; display and sale of fresh organic produce as well as pickled and processed food products; weaves in both traditional and contemporary styles; traditional boat race as well as adventure sports like parasailing, paragliding, and hot air ballooning; a quiz show; a beauty contest… and much more ! Unfortunately I couldn’t attend any of the adventure sports events as I was busy exploring Guwahati (posts will be up in the coming weeks). 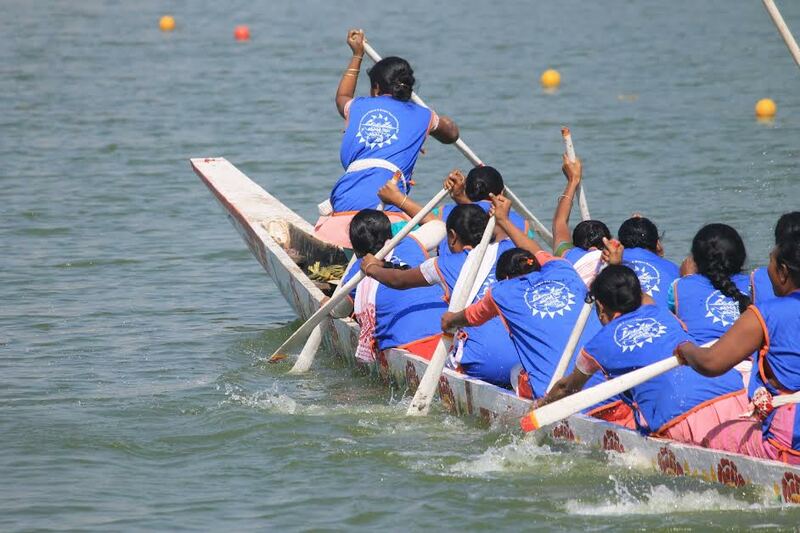 I did, however, manage to see the fag-end of the traditional boat race and was absolutely delighted to see women’s teams participating in it. Please click on any photographs below to start a slide show and read the captions. You can then use the arrow keys to navigate and see the other photos and their details. 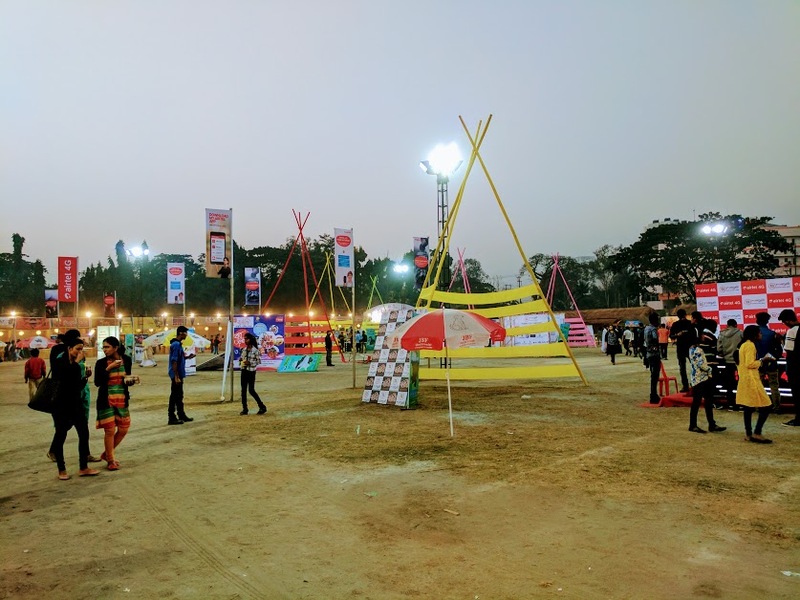 Khanapara Veterinary Grounds – the venue for Rongali 2017. The Rongali venue was huge and in spite of large numbers of people visiting the Festival, it never really felt crowded. Of all the events that I saw, two of them stood out. The first was the Rongali Quiz conducted by Quizmaster Manimugdha Sharma (or Quizzical Guy). It was an event I was looking forward to the most, as I saw this as an opportunity to learn more about Assam and the Northeast. I wasn’t disappointed for the quiz and the way it was conducted was fantastic and going by the audience reaction, they thought so too. I must admit here that I did embarrass myself by getting only 2 answers right in the entire quiz ! And I thought I was well read and informed. 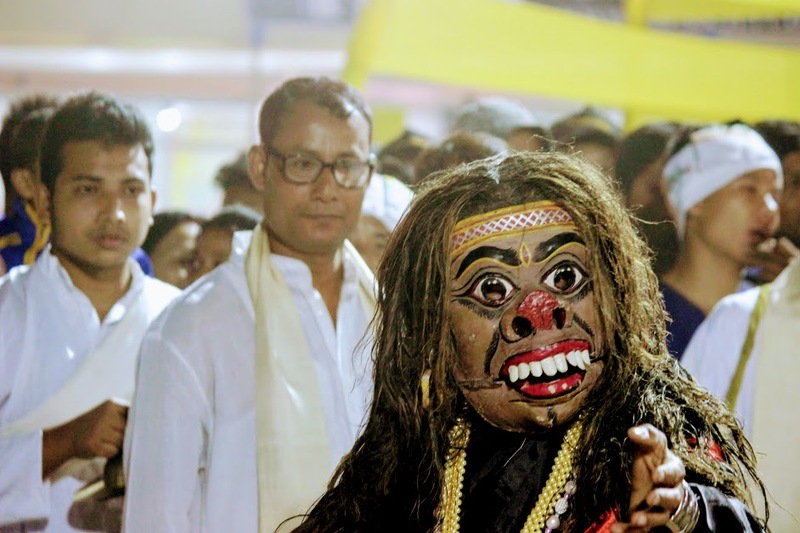 The second was the stall set up by Samaguri Sattra of Majuli that exhibited and sold masks, and also performed dance dramas at the venue by using these very masks. 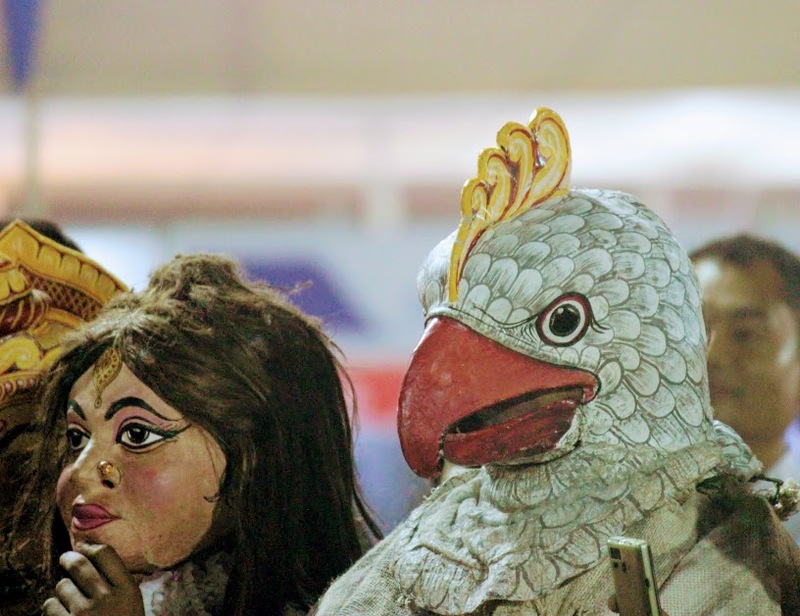 These masks are used in Bhaona, a folk theatre form from Assam. These masks are created on a framework made of either cane or bamboo, which are then covered with local mud before being shaped painted with colours derived from plants and minerals. 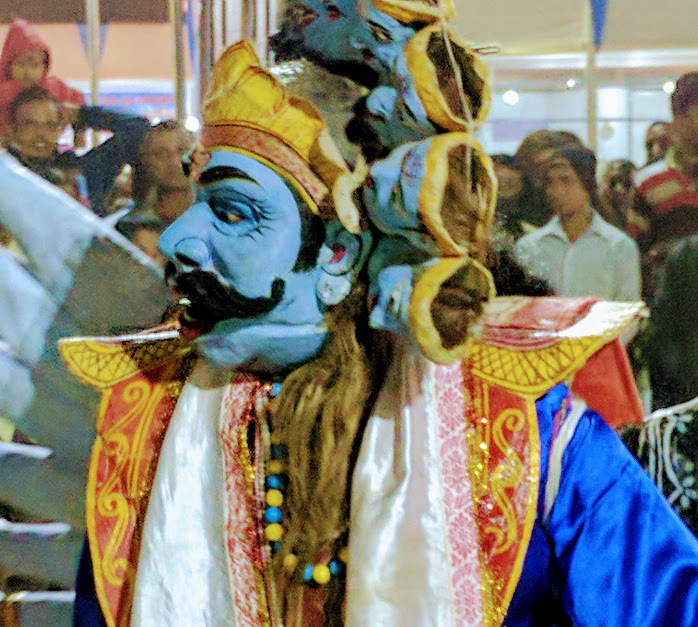 These masks are very expressive as you will see in the pictures below and I loved the short performances I got to see — all of them from the Ramayana. 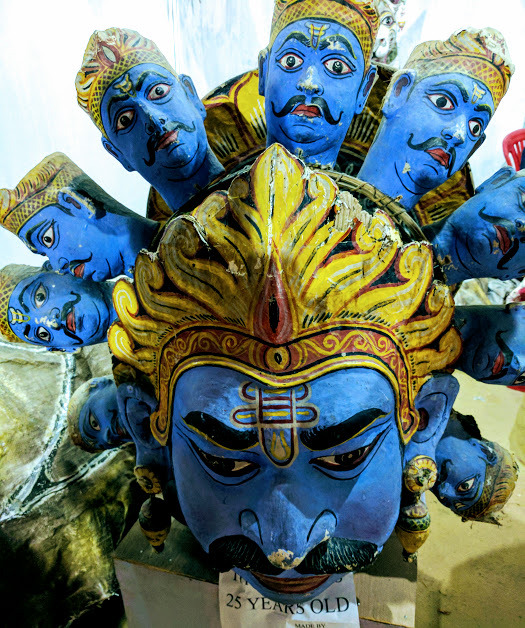 For more on the masks, do read this article by Sangeeta Barooah Pisharoty. 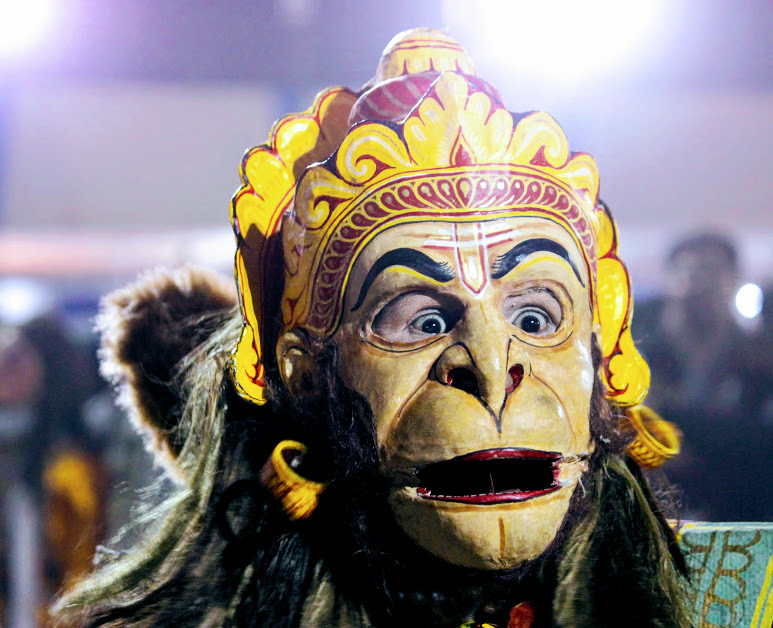 From the Ramayana: Sugriva, the king of the vanars, reacts when he realises that his older brother, Bali is alive ! The musicians of the Bhaona performance. Music or rather the rock music shows at Rongali were the biggest draw as far as the crowds were concerned. With performers like Joy Baruah, Zubeen Garg, and top bands like Parikrama, Euphoria and North East Breeze, among others, it wasn’t surprising to see people making their way for the shows. However, rock music, or rather live rock shows are not for me. I attended one of the concerts at Rongali, or rather tried to attend for I left after a while — the dancing lights made me dizzy, and the volume of the music gave me a headache of epic proportions. Others from the media team that I was part of did enjoy the shows though. 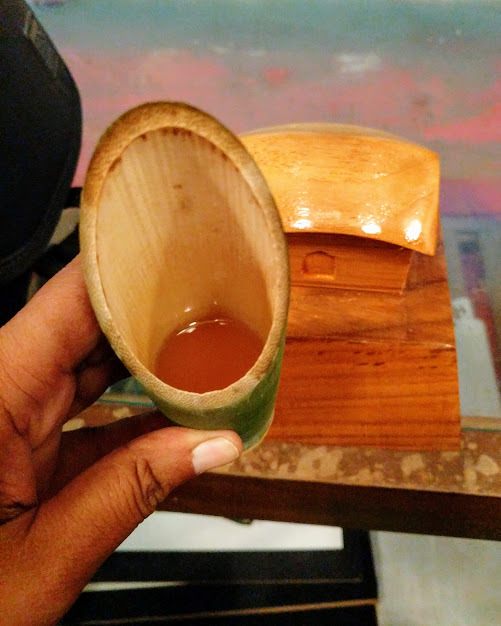 The Rongali Festival was also about Assam as a travel destination and there were many stalls from different parts of Assam to ‘showcase’ their regions as a travel destination. 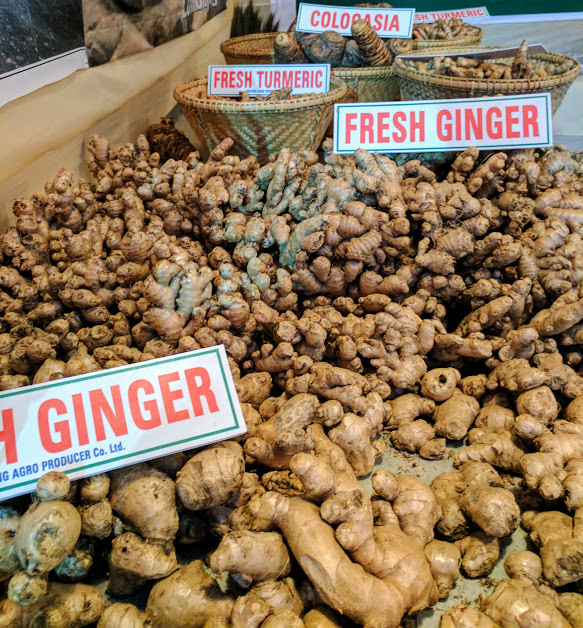 Every aspect of a particular region, be it the tribal house re-created for the Festival or the food or handicraft stall of a particular region or tribe or the tourism enquiry specific stall — were geared to attract and entice potential travellers. As I walked through the stalls talking to the representatives and looking at the posters displayed or collecting the brochures, I couldn’t help thinking of the raised eyebrows and questions when I told my friends and colleagues that I was going to Assam. The questions ranged from “Is it safe to travel to the Northeast?” to Why Assam? Why not …………. [insert neighbouring state here]?” to “The weather’s terrible and there is nothing to see in Guwahati!” to “Why go all the way to Guwahati to see cultural programmes?”. My response to these questions would be to just smile and move on. But it wasn’t until I actually arrived in Assam that I realised that these questions were on my mind too, albeit masked under curiosity about seeing a new place. I had arrived three days prior to the commencement of Rongali (3-5 February 2017), so that I could do some travel in Assam on my own — Kaziranga, Jorhat, Sibsagar and Charaideo — before returning to Guwahati to join the rest of the media team invited for Rongali. Assam was a revelation in every possible, positive way (which I will be writing about it in the coming weeks), but what stayed with me the most was just how safe I felt. No stares, no questions, no requests for selfies; just warm smiles of welcome everywhere and curiosity about where I was from. The absence of a security check at the Rongali venue — which would not have been possible at an event like this in a city like Mumbai or Delhi — really made me notice and acknowledge just how different and peaceful it was. Also, even though the Rongali venue was full of people, there was a relaxed air rather than the edginess and aggressiveness I was used to at events like this. It made me wonder about the general perception of the Northeast as an unsafe place and the memories of Assam Movement that I grew up reading about in the newspapers. If I hadn’t travelled to Assam, I wouldn’t have realised how deeply entrenched these perceptions and memories were or known that things have changed. Another example of how travel changes perceptions for the better. Disclaimer: I was part of the team of journalists and travel writers who were invited by the Rongali Team. This post is an outcome of my Rongali experience. Needless to say, the views and words in this post are all mine. Id love to go to Assam with you and have you curate a trip for One Life to Travel. Please do curate a trip for OLTT Sudha; and join us again in 2017. Great impressions, Sudha. We had been to Assam and Meghalaya at the height of the Bodo agitation in that region. And yes, Assam is a very friendly state and the people are so simple and sweet. Yet to visit Meghalaya, Zephyr, but from what I hear and read the North-East is very friendly region. So far I can only speak about Assam and I loved every minute of my stay. I can’t wait to visit again. Hopefully I will be able to later this year on work and, in the process, take some time off to explore more of Assam. Wow! That must have been a wonderful trip! Loved your descriptions. Can’t wait for your next post! My bad ! It would have been nice to finally meet you, Shubham. And thank you for your comment. The Assam set of posts will take some time to come for I have to write about my Hadoti and Kanchipuram trips before that ! There are too much wrong perceptions in the mass media about Assam and glad to read this first-hand account. Heard so much about Rongali and it seems to be sheer delight experience this cultural richness in Assam. I think wrong perception are everywhere, but the Northeast gets the lion’s share of it. Also for some reason, I find that apart from Kaziranga, which I visited, and Majuli, which I didn’t, visitors rarely go elsewhere. Also, Guwahati is used as a gateway to the other parts of the Northeast. 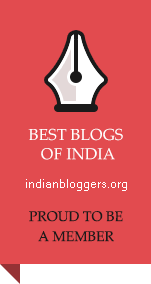 This is a pity for Assam has so much to offer and there is something for everyone. i hope that in the coming months and years, more people visit and explore other parts of Assam and not just the ones I have mentioned. Great Information given by you. Good to know about Assam. Thank you, Sunil. Hope you’ll be visiting Assam soon? The images are so fresh, never before seen. Beautiful ones. Thank you very much, Lata. I guess Assam is not really a destination in the sense of something beyond Kaziranga and a gateway to other parts of the North-East. I had read this post. Score, I can’t figure out why I didn’t comment, though. Let me rectify that right away, this has been one of my favorite posts in recent times. The sheer colorfulness of Rongali make me happy. What a wonderful festival and I loved that they made room for organic produce. I find I’m a big fan of farmers markets and locally owned, locally sourced food these days. Thank you, MM. 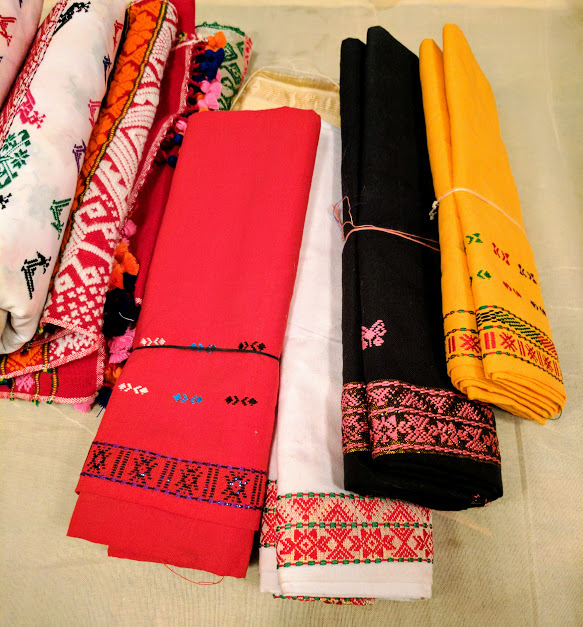 Rongali was a great introduction to the cultural diversity and richness of the Assam and, to a certain extent, the Northeast. It was also celebration of all things local, in this case the North-East region. I found that culture, food, art and craft lived up to this theme, though music had ‘outside’ elements. 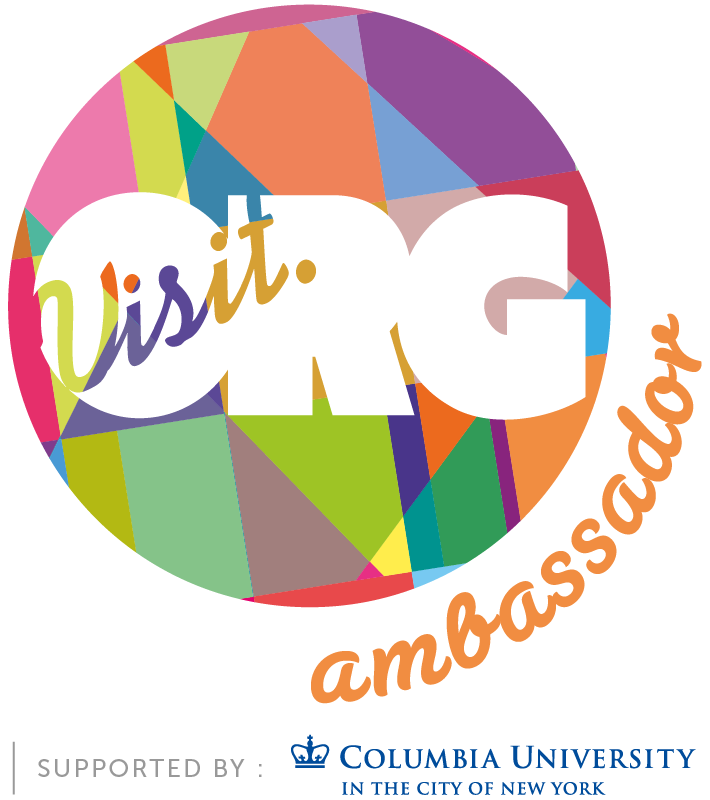 I’m already looking forward to visiting next year and exploring a more of the state. There is so much to see !